One of New South Wales’ untapped treasures, Port Stephens promises a tranquil bayside retreat all year round and beckons travellers to its unique combination of sheltered waterways, golden beaches, steep sand dunes and pristine national parks. And taking its position in the heart of this coastal holiday haven in Salamander Bay lies Oaks Pacific Blue Resort; a warm and welcoming choice for holidaymakers seeking affordable, self-contained convenience and an impressive selection of leisure facilities – including Australia’s largest swimming pool! Staying at Oaks Pacific Blue Resort makes exploring Port Stephens and its many family-friendly attractions easy; from departing on a marine life adventure life aboard a local vessel from the Nelson Bay Marina (Port Stephens is referred to as the whale and dolphin capital of Australia! ); to casting a fishing line; boating around the bay; sand boarding or four-wheel-driving down the Stockton Bight Sand Dunes; or catching a wave at the handful of surfing hot spots. 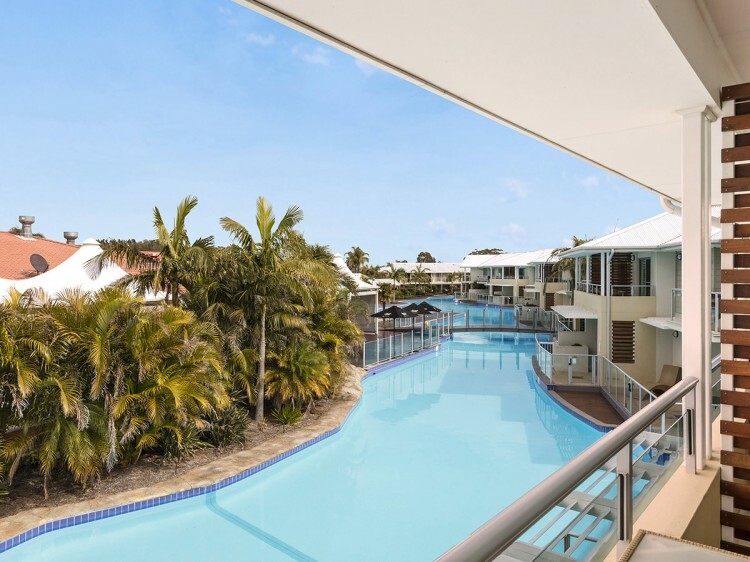 Oaks Pacific Blue Resort offers a laidback resort lifestyle set amongst lush, tropical gardens, comprising a selection of deluxe studios and thoughtfully-appointed one, two and three bedroom apartments – some with swim-out facilities, spas and private plunge pools. All apartments feature full kitchens, king size beds, contemporary furnishings and air-conditioning. 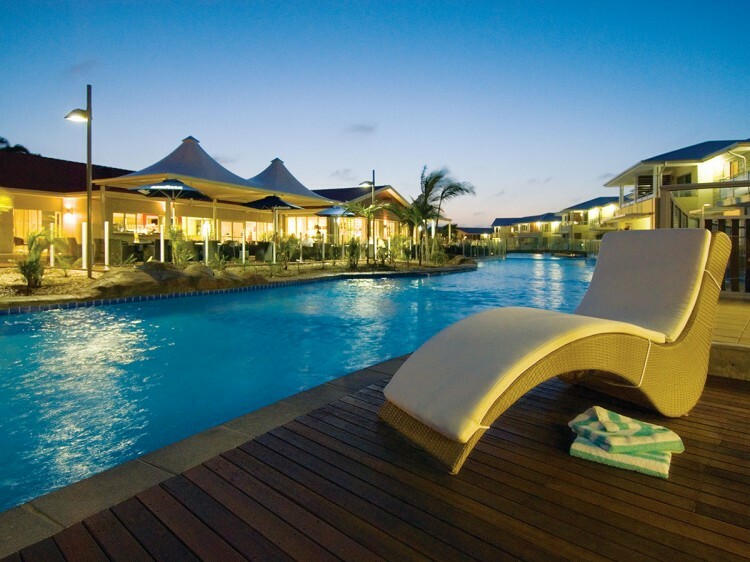 In addition to the resort’s legendary 500 metre island lagoon pool complete with children’s wading area, Oaks Pacific Blue Resort also features a gymnasium, heated spas, Japanese steam room, separate heated 25 metre lap pool and two floodlit tennis courts – meaning you can do as much or as little as you like while on holiday here. 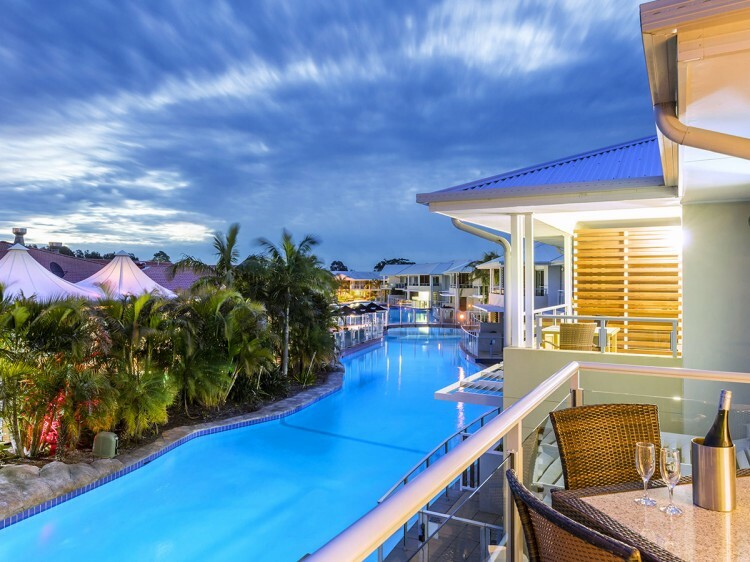 Suited to couples, families and groups alike, Oaks Pacific Blue Resort is only a short drive to the charming Nelson Bay and an easy 2.5 hours drive from Sydney and 35 minutes from Newcastle Airport. 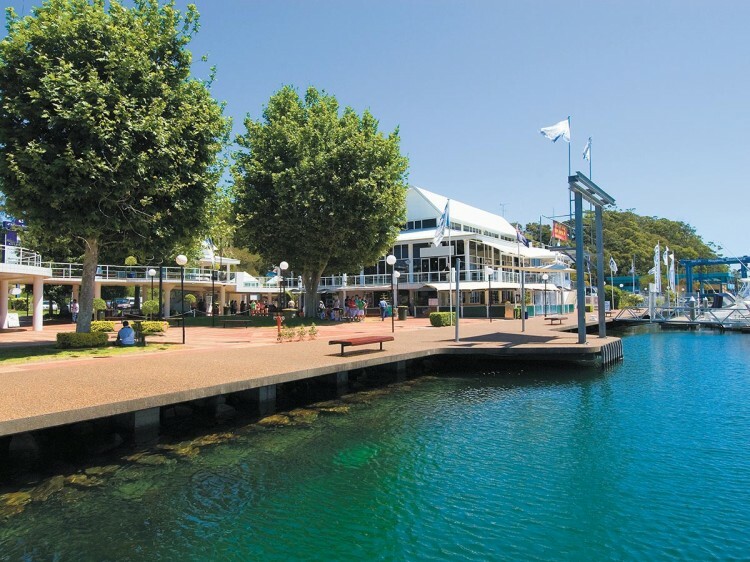 It is also surrounded by an array of restaurants, cafes and shops as well as the Salamander Bay Shopping Centre and Nelson Bay Lighthouse. Open plan hotel room with kitchenette facilities, located within the main complex. Open plan hotel room with kitchenette facilities located on the upper floor with stair access. Open plan hotel room with kitchenette facilities and features direct access to the lagoon pool. Located on the upper floor with stair access featuring separate bedroom, balcony, full kitchen, laundry and corner spa bath. Features separate bedroom, balcony, full kitchen, laundry, corner spa bath and direct access to the lagoon pool. Located adjacent to the lagoon pool, bathroom with separate bath and shower, full kitchen, laundry, living and dining area. Dual-key consisting of Studio Lagoon and 1 Bedroom Lagoon. Located on the upper floor with stair access. May not be suitable to families with young children. Dual-key consisting of Studio Swimout and 1 Bedroom Swimout. May not be suitable to families with young children. Spacious two storey apartment with full kitchen, laundry, single car garage and private plunge pool. All bedrooms and two bathrooms are upstairs. A valid credit card pre-authorisation will be required on arrival and will be used to cover incidental items. Cash is not an acceptable form of bond when staying with Oaks Hotels & Resorts. No changes or cancellations are permitted to “Promo” room types, "No Refund" room types and "Stay Save" room types.